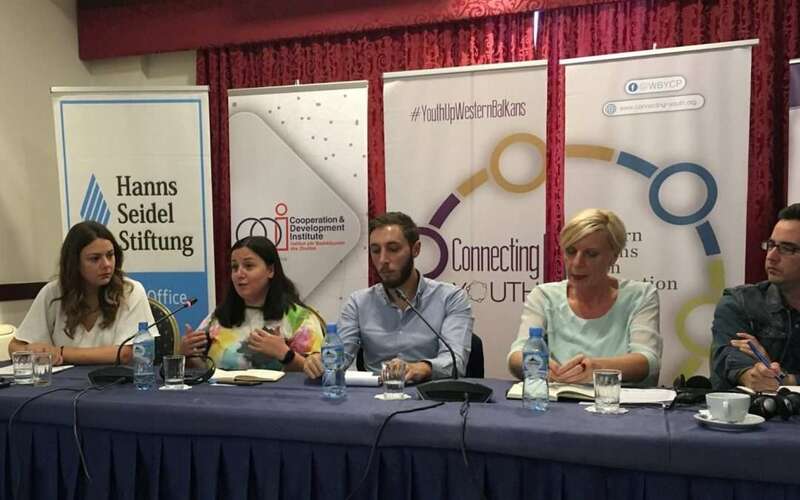 CEP Project Manager Meliha Muherina has moderated a round table at 1st “VOICE UP” Western Balkans Youth Forum organized by Western Balkans Youth Cooperation Platform (WBYCP). WBYCP is a grassroots regional youth platform implemented by Cooperation and Development Institute (CDI), together with the umbrella youth organizations of the Six Western Balkans countries: National Youth Congress of Albania, National Youth Council of Macedonia, National Youth Council of Serbia, High School Students Union of Montenegro, Central Youth Action Council of Kosovo and Bosnia and Herzegovina Association for United Nations, and with the support of Hanns Seidel Foundation. Youth Exchange Programme was organized from 9-11 October. It was execution of an outreach phase of the essay competition titled “Three reasons to stay in my country” launched by WBYCP in June 2018. 12 best essay authors have been invited to share and discuss youth emigration, its implications for the youngsters and the region, the necessary policy measures and actions to stem the loss of human capital and reverse it. WBYCP partner organizations and other stakeholders working with youth topics in the region and in EU have joined the debate. In the course of two days, the discussants unfold the ideas and issues expressed in the submitted essays which have been identified as some of the most pressing issues of Western Balkans Youth: (i) Education and Youth Employment; (ii) Youth role in WB6 institutional Governance and Policy Making. WBYCP Forum was organized on October 12 and offered a discussion space where youngsters built up a common position and voiced up their shared understanding of present and future challenges, together with required action. They had the opportunity to discuss them with policymakers and other youth stakeholders in the region. A WB6 Youth Statement on Youth Migration in WB6 was drafted and submitted to the relevant decision-making actors. Instead of focusing on problem solving, the forum promoted positive examples of young people mobility – geographical and career-wise, experiences of building build social capital, successful actions of committed young citizen, and other beautiful and inspiring life experiences of Balkan youth.